The bug themed metroidvania also sees its first sale on Switch! Team Cherry has pushed out the fourth and final piece of DLC for the fantastic Hollow Knight. Titled “Godmaster”, the new content pack joins previous add-ons Hidden Dreams, The Grimm Troupe and Lifeblood on the Nintendo Switch eShop. Hollow Knight is a 2D Metroidvania-style game set in the ruined kingdom of Hallownest. Players guide a heroic Knight on a mission to uncover ancient secrets and mysteries of the underground world. Along the way, you’ll take on a slew of bugs, track down hidden charms, go nail to head with brutal bosses, and gain powerful new skills. In the game’s biggest content pack to-date, adventurers can expect brand new characters, quests, challenges, and secrets. 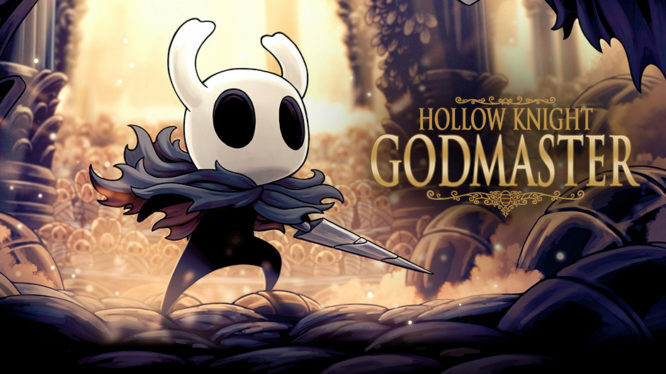 Godmaster brings the Knight’s story to a close and promises to up Hollow Knight’s difficulty even further. To celebrate its release, Hollow Knight (complete with all content packs) is on sale this weekend until August 27th, 2018. If you’ve not yet picked it up you can grab the game from the eShop for £7.25 / $9.90 / €9,89. For those who prefer a physical to digital are also in luck when the definitive version of Hollow Knight hits shelves in Spring 2019.